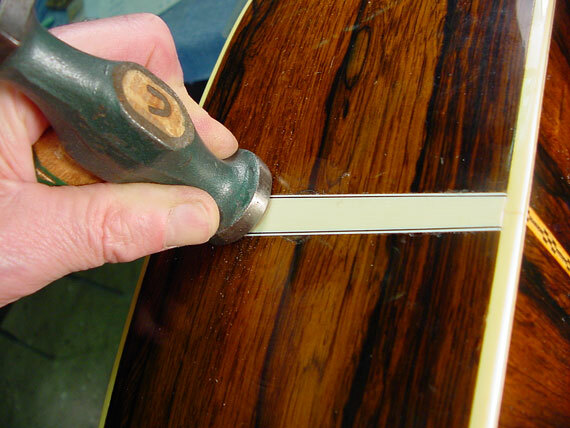 These days, we're installing a lot of pickups in guitars and other instruments, and, in doing so, we're making some compromises on their "originality" and appearance. Most folks agree that replacing the endpin with a "strap jack" or "endpin jack" assembly is a small downgrade in appearance, and one that isn't too unappealing. But, for some, the half-inch hole is a bit of an eyesore. 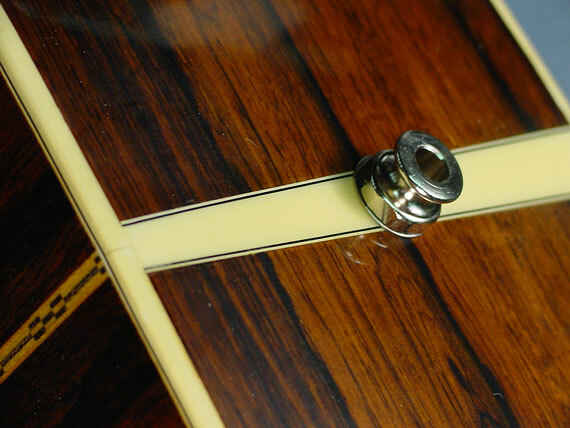 If the pickup is no longer desired (say, when the instrument is resold to a player who will only use it acoustically) then it makes sense to return to the original style endpin. In fact, a regular endpin usually works better than a strap jack to hold a conventional strap. 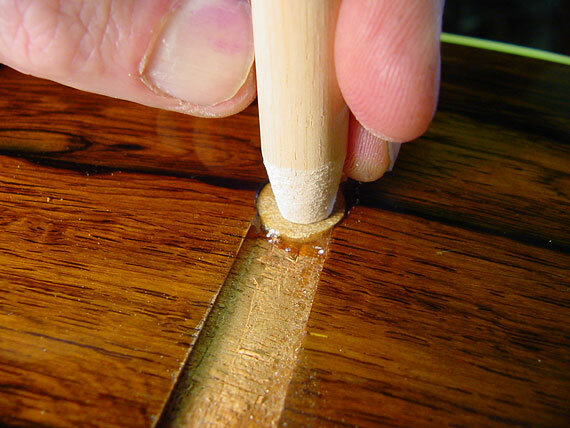 The usual way we deal with returning to the original style smaller end pin is to fill the hole and redrill, leaving a small "donut" of new wood surrounding the original pin. That's not too unsightly, and it's not a particularly time consuming to do. Recently, there have been some fine new solutions to the problem, including a variety of non electric endpins that fit the enlarged hole left when the strap jack is removed. 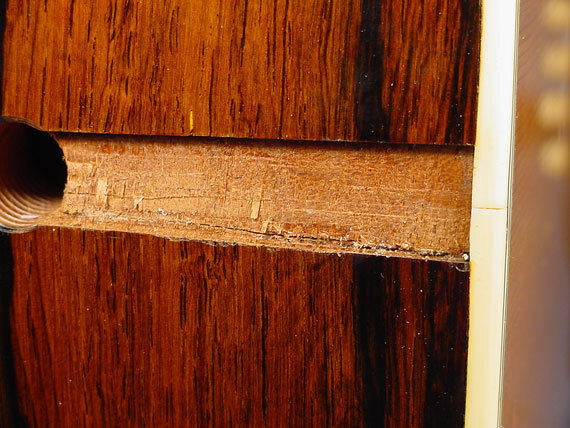 Confronted with a guitar like this one, we're tempted to take a more strict conservator's view. This guitar is in nearly perfect original condition, and it's a valuable Martin D-28 made with some of the most elegant Brazilian rosewood. So, it seemed a perfect candidate for an all-out effort. Unfortunately, the endpin hole was drilled out to even more than the conventional half inch diameter. To avoid the inevitable patches, I decided to remove and replace the entire end wedge. A good time to try out my little .006" kerf "circular backsaw." 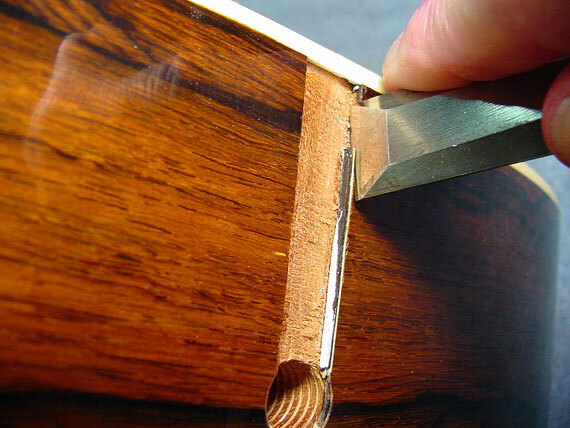 Then, it was easy to break out the remaining pieces of purfling without chipping the finish. 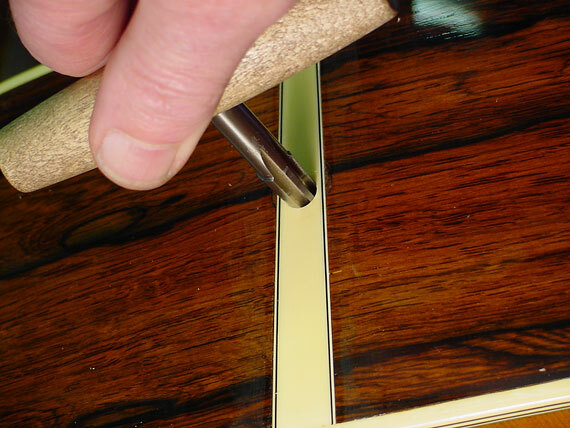 It was vital not to go through the finish, because the wood had lightened considerably since the instrument was made, and I'd have a nightmare trying to add new finish and keep the wood from darkening beneath. Here it is, all cleaned out. Notice the large hole, extending pretty far beyond the boundary of the wedge. At this point I agonized a bit, but finally decided not to widen the wedge, but to try for the most original appearance I could get. I made a little dowel to fit the hole tightly, and tapped it in place with hide glue, using a smaller dowel as a "drift." 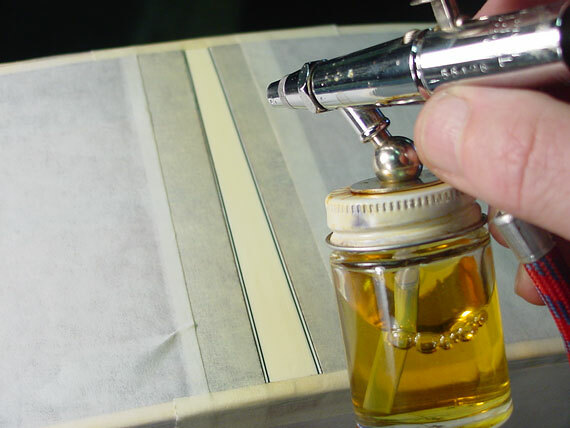 I chose hide glue because of its rigidity, and because it wouldn't be difficult to remove if I spilled some on the finish. 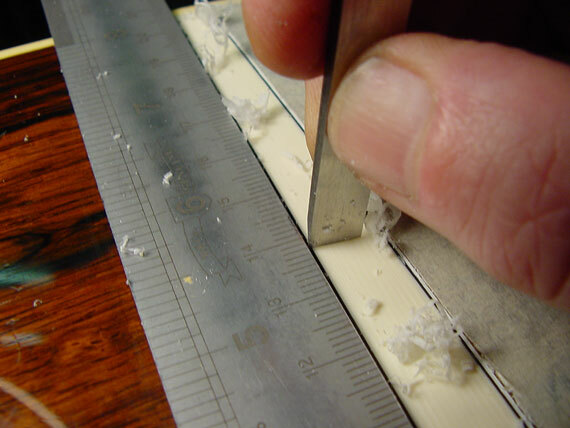 After the glue set, I chiseled off the protruding bits of dowel, leveling everything to the same height as the original recess. 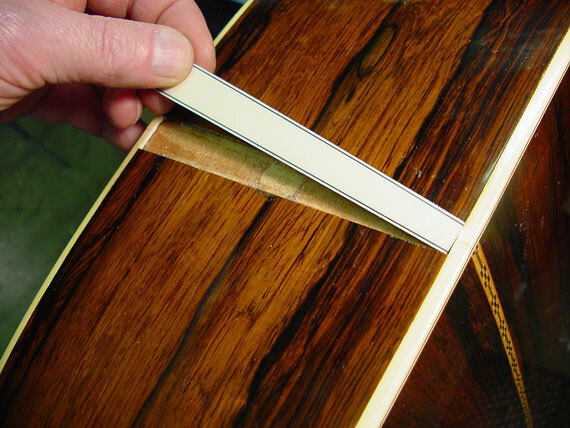 Next, It was a trip to the scrap boxes to find just the right piece of Brazilian rosewood to make my little crescent shaped repair patches that would stick outboard from the wedge. I made them considerably oversize, but just a little lower than the lacquer surface. My little cut off X-acto saw made quick work of truing up the inside edges. 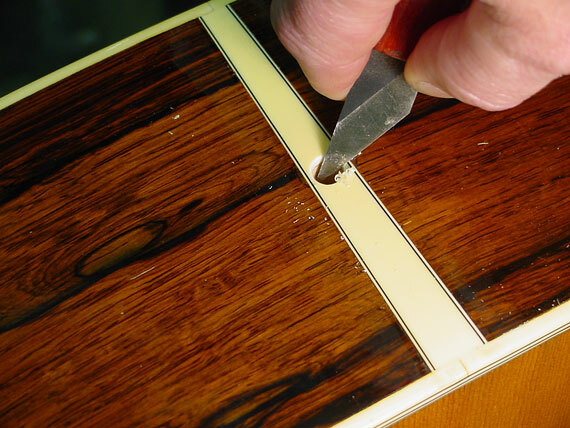 I dropped some clear lacquer on top of the little sections, so my touchup would be dry when it came time to finish the job. 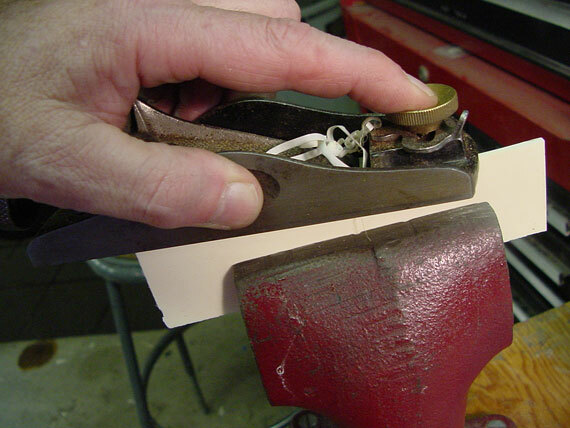 I find this little low angle block plane ideal for straightening the edge of a small celluloid section, and I used it to make my new end wedge from some .080" thick ivoroid. 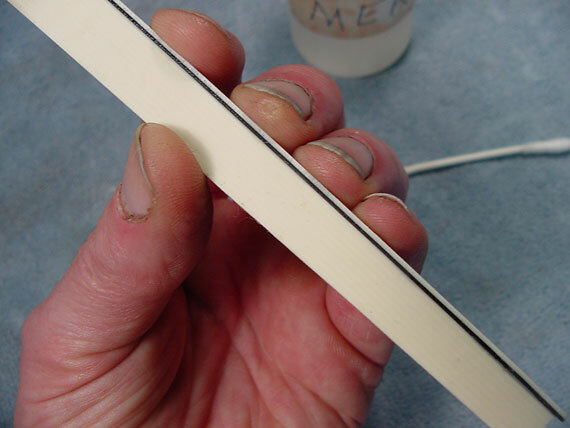 The laminated black and white purfling lines were the same dimension as Martin uses today, so it wasn't difficult to obtain the correct thickness. 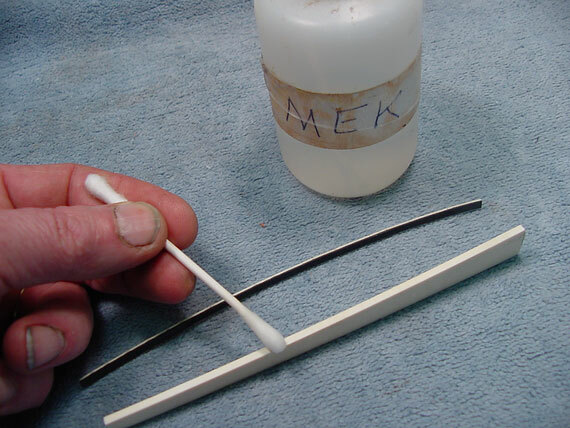 I simply painted both surfaces with methyl ethyl ketone (MEK) to soften the plastic. Then, I could simply hold the pieces together to weld them solidly and straight. It took a while, but I got the piece cut so it fit nicely in place. 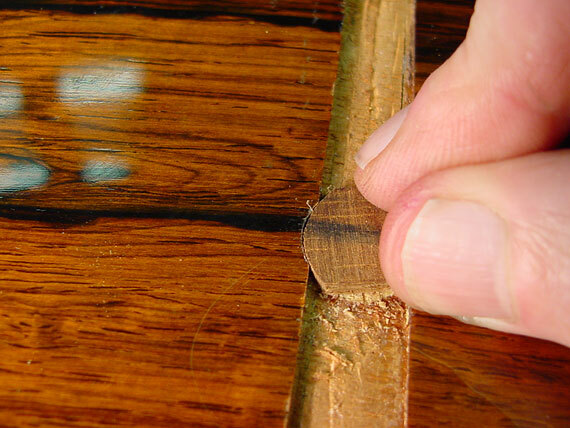 With some medium viscosity superglue underneath, I used my flattest hammer to "iron" the piece in place, wiping off the small amount of squeezed out glue immediately before it had a chance to eat into the finish. 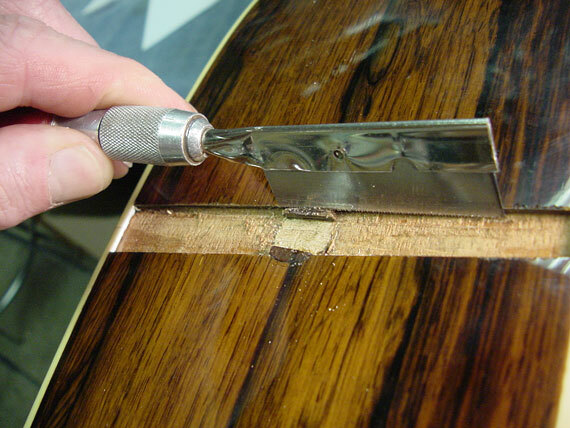 Once the glue cured, I was able to scrape the new wedge right down to the level of the surrounding finish. 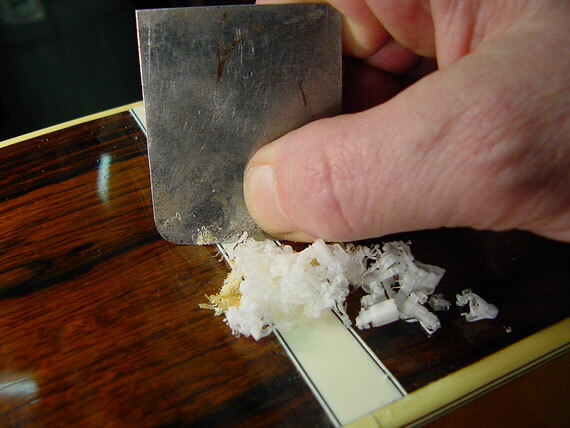 Notice the plastic tape which kept my scraper from scratching the lacquer. Here's where the tricky stuff begins. I taped off the finish, and, using a straightedge to keep from slipping with my chisel, I scraped the surface of my new plastic around .005" below the surrounding surface. My new ivoroid wedge and black/white purflings looked a bit stark because the lacquer had darkened with age over the rest of the binding. 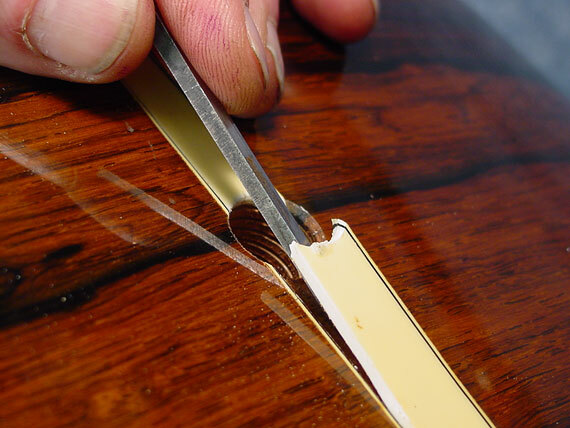 Time for some of my special aged amber lacquer. A few coats with my little airbrush, followed with some clear lacquer did the trick. After I leved and polished the finish, drilling and fitting up the original end pin was the easy part! A little chamfer on the hole for that nice fit and original look. Looking through my old parts drawers, I was able to find a suitably discolored original D-28 end pin, presumably salvaged from a pickup installation. . . Done. Sure, you can see the little crescent shaped fills, but chances are you wouldn't notice them if you didn't expect to see this repair.